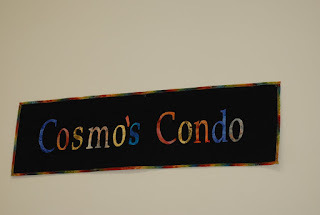 Studio Jules Art - Blog: Cosmo's Condo Complete! Well, I actually got Cosmo's Condo complete today. The Quilt Studio sign will wait until tomorrow, my sinus/ear infection would only let me finish one thing today. After pressed the letters back, in the correct order and no additional letters it was ready to hang! Instead of putting a traditional binding on the sign I decided to stitch a multi-colored ribbon on the edges. The ribbon goes so well with the batik fabrics that I used and I like to use different finishings on my art quilts. After I finished the re-application of the letters my "Mr. Wonderful" put three black grommets across the top for me. Then we hung the sign quilt with nails and colored the nail heads with a black Sharpie.